The first snows of the season have already fallen at Crater Lake National Park, and some of the most beautiful days in the park include those fresh snows. Early fall is a great time visit the park before Old Man Winter wraps his hand around the park. Basin Adventures is sponsored by the Klamath Falls KOA Journey, the adventure base camp of the Klamath Basin. At the time of this publication, Rim Drive is still open. However, West Rim Drive is closed weekdays for Road Construction and some of the parks amenities have already closed for the winter season. Be sure to check the National Park Service website for Crater Lake (https://www.nps.gov/crla) for any changes. The hike up Watchman Peak Trail should take the average person one hour and is moderately difficult. The 1.6 mile round trip hike offers, arguably, the best unobstructed views in the entire park. When hikers travel this trail in the afternoon before sunset (and the sky’s are clear), they are rewarded with an amazing panorama vista and can see from Mount Bachelor in the north to Mount Shasta in the south, and a looking down into Wizard Island. Atop the peak is the historic Watchman fire lookout tower. The inside of the tower is closed to public access, but you can peak through the windows for a glimpse into the past. Discovery Point is located just a mile west of Rim Village. This is a large parking area at the Discovery Point Trailhead. This parking area is an excellent location to watch the sun rise in the east and shadows disappear along the caldera rim. This location is also rarely windy and has some of the fewest amounts of mosquitos on the rim. Making it perfect for watching sunrise. The Sun Notch area of Crater Lake has some of the best viewing of the second island in Crater Lake, Phantom Ship. This location offers a recently rehabilitated trail that loops a half mile from the parking area to the rim and back. The trail offers a gentle grade and broad even pathway. Along the rim are several benches and flat surfaces to rest and enjoy a picnic. Pro Tip – Be sure to bring bug spray with you for your picnic. Otherwise, you might become lunch for mosquitos. 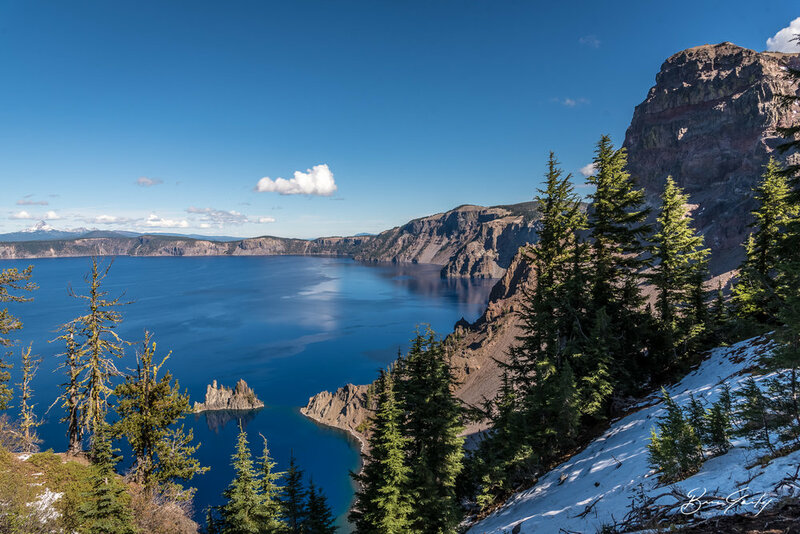 The Plaikni Falls Trail is one of the newest trails in Crater Lake National Park. This trail is a 1-mile out and back trail (2-Miles round trip). This is an easy trail with benches for rest and is even wheelchair accessible too. 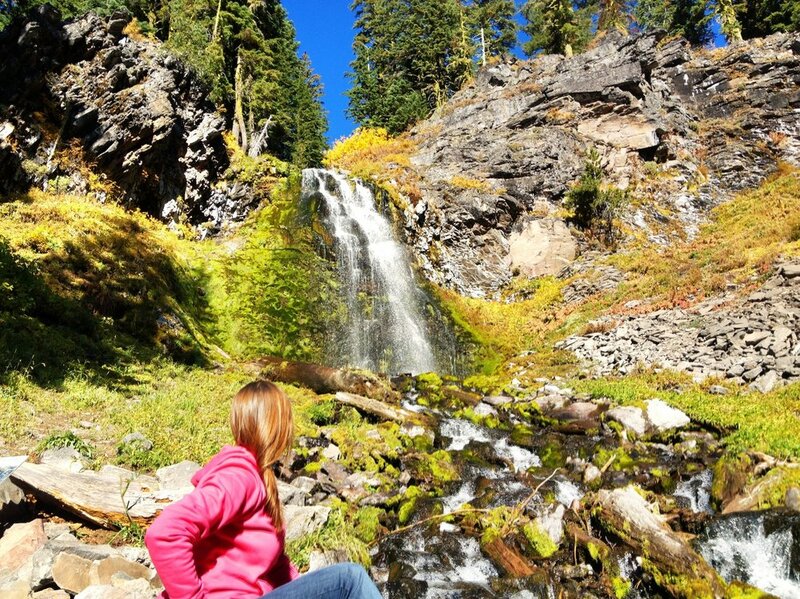 The easy mile long hike has a great reward of a beautiful waterfall that tumbles over a glacier carved cliff. The best views of this waterfall are in the mornings before the shade covers the falls. Crater Lake is a stargazer’s paradise. Removed from major light sources, 100 miles in any direction. City light pollution is a minimum and is only experienced along the horizon. Straight above, the stars are free of any light pollution. Recent camera technology advancements and the easy access of Crater Lake has made it a favorite for nighttime photographers all around the area. Merriam Point is one of the best locations for watching the Milky Way pass over head. Fall constellations that can be seen in the early evening hours after sunset and before midnight are – Cassiopeia and Perseus. Of course, Polaris (the North Star) Ursa Major (Big Dipper) and Ursa Minor (Little Dipper) are visible also. Klamath Falls KOA - Your Basin adventure basecamp. Basin Adventures is brought to you by the Klamath Falls KOA. Centrally located in Klamath Falls, the Klamath Falls KOA is the perfect jump-off point to visit all the spectacular recreation sites of the Klamath Basin – Crater Lake National Park, Lava Beds National Monument, wildlife refuges, hiking, biking, fishing and so much more. Visit http://koa.com/campgrounds/klamath/ for more details and to book your next adventure base camp.